How do my kids start their day? With a big breakfast. While our mornings are sometimes a little rushed, I always make it a point to sit down with the girls to eat at the table. As much as they’d like to watch cartoons, the TV stays off! We talk about what we’re doing that day, maybe review notes for an upcoming quiz, and just enjoy our time together. After all, Maya’s at school all day, so we won’t get to do this again until dinner time. While the actual meal may vary depending on the day of the week – oatmeal or cereal on busy weekday mornings, eggs and pancakes on weekends – it’s always accompanied with a glass of Florida orange juice. Sometimes I’ll even offer the girls a ‘juice bar’, where they can create their own juice concoction by mixing orange juice with some freshly-made stuff that I prepare with our juicer with whatever we happen to have on hand. Orange-kiwi-mango, orange-pineapple with a splash of cranberry, orange-carrot… you get the picture. It’s yummy. Oranges have been grown in Florida since the 1560s, almost 150 years before any other U.S. state. Tropicana Pure Premium is 100% Pure Florida Orange Juice. Tropicana Pure Premium is actually a blend! The two major orange types used are Valencia, which typically have more intense color and flavor, and Hamlin, which can be sweeter. Tropicana is the single largest buyer of Florida fruit, buying almost 12 billion oranges from Florida each year. It’s available all year because the different microclimates and soil types in Florida mean that fruit reaches peak maturity at different times, allowing Tropicana to harvest ripe fruit throughout the entire growing season. Each 59oz container of Tropicana Pure Premium has 16 fresh-picked Florida oranges squeezed into it. Yum. An 8oz glass gives you 100% of your daily vitamin C requirement, to help you maintain a healthy immune system. Like www.Facebook.com/Tropicana and click on the ‘Sweeps’ tab. You’ll have a chance at winning 100 Florida prizes, including one-year-supplies of Tropicana and a trip to Florida to visit an orange grove, like the one picture below. I can smell it already! 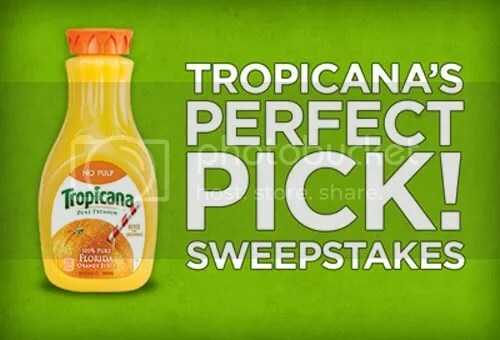 99 winners will get coupons for a one-year supply of orange juice. 12 of those 59 oz Tropicana Pure Premium containers. One grand prize winner, along with 3 guests, will get a trip to a Florida orange grove. Airfare and hotel included. Disclosure: I wrote this blog post while participating in the SocialMoms and Tropicana blogging program, to earn My SocialMoms Rewards Points. The opinions and ideas expressed here are my own. I always love their product. This has kept me always healthy and avoid getting sick. I add some daily walking as an exercise. I love Tropicana. What I love about Tropicana is the real orange taste, unlike other fruit juices that you can taste the artificial flavorings. Tropicana has real orange pulp which came from freshly picked and processed oranges. I loved Tropicana because it has a great taste and you get vitamin c from the juice. Tropicana is one of the best beverages I ever tasted. I love the pulps in there.. My little girl really like to drink this juice.